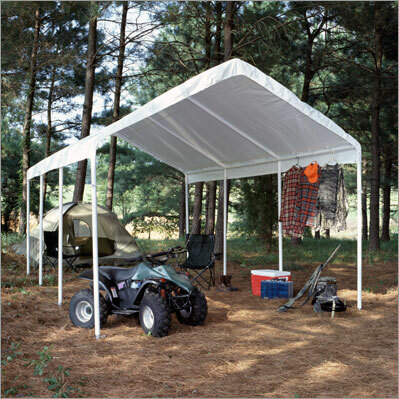 Dimensions: 10' 8" x 20' canopy with a side height of 6' 8" and center height of 9' 9"
An 10 ft. x 20 ft. canopy provides tons of space for all of your outdoor activities - you probably already know that. It's so spacious, in fact, that some owners use the structure for hosting outdoor parties, while others keep a car or a piece of equipment underneath. The 20 gauge steel frame provides tons of strength for whatever you have planned, and the frame features a white powder-coated surface for added moisture and rust-resistance. What you may not have guessed is that the 8-leg design of this tent yields a stable, well-grounded structure thanks to all of the points of contact with the ground. The plastic foot pads protect whatever surface you choose to place this shelter on, so you can even set it up on top of a surface you'd rather not have scratched or otherwise damaged. To top it all off, there's a waterproof white polyethylene cover that protects either guests or automobiles. So there you go. Versatility, style, lots of function, plus it's a truly cost-effective means of providing outdoor shelter. For people interested in a multi-function and affordable option for outdoor celebration or storage, the 10 x 20 Hercules Outdoor Canopy Shelter from King Canopy saves the day, saves you money on a great canopy.